AS THE SHOW'S ONLY ON-STAGE HUMAN, FRAN ALLISON, TALKS TO THEM. 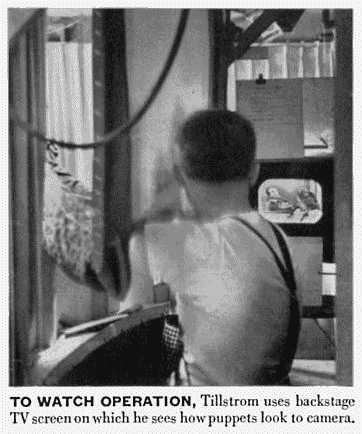 The young man with the crew haircut above is masterminding what has become, in a little over a year and with a cast of only one visible human, one of the most popular of all TV programs. 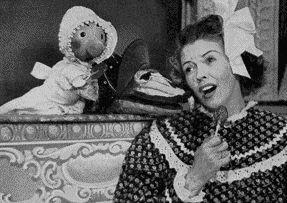 Called Kukla, Fran and Ollie (NBC-TV 7 p.m. E.D.T., Monday-Friday) after its principal characters, it is a children's puppet show whose audience is about 60% adult. Like Bergen's old Charlie McCarthy program, its charm lies in the complete credibility with which the show's creator, a 31-year-old bachelor named Burr Tillstrom, has endowed his hand-manipulated characters. Kukla (from the Greek word for doll) is an earnest, strangely bald youngster, always in trouble, mostly through the antics of an irresponsible, one-toothed dragon named Ollie, whose ancestors lost their fire-breathing apparatus after swallowing a quantity of sea water swimming the Hellespont. Fran, the show's only visible human, is a quick-witted ex-schoolteacher named Frances Allison, who carries on amiable, highly reasonable conversations with the puppets. KUKLA'S VARIED COSTUMES, which match his versatile characterizations, range from Sherlock Holmes get-up to Mikado garb. The nose snood was knitted by an admirer who feared Kukla's nose might freeze in bad weather. The show's gentle spontaneity arises from the fact that all dialog is ad-libbed by Tillstrom and Fran. Tillstrom speaks for and manipulates seven other puppets on the show besides Kukla and Ollie. 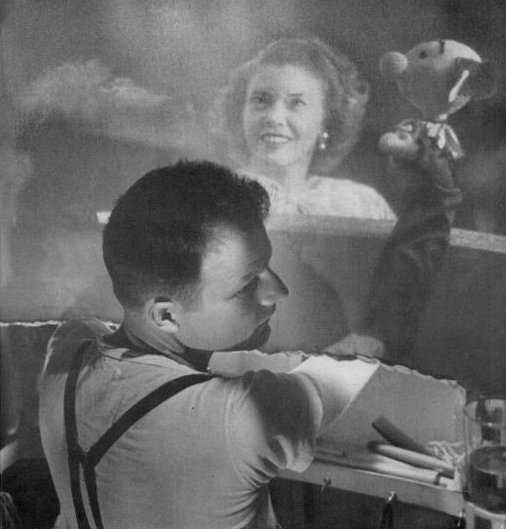 By now he has made his characters so credible that once when Kukla blew his nose on the theater curtain, worried fans sent in 250 handkerchiefs. THE TRIO explores the baby-sitting problem. Dressed as babies, Kukla and Fran try to outsmart stern baby-sitter Ollie who quickly squelches all their childish capers. Then they wind up mournfully singing The Baby-Sitter's Blues.